The toothbrush mustache was quite popular in the 1920s and 1930s. It was worn by such beloved comedic figures as Oliver Hardy (of Laurel and Hardy fame) as well as Charlie Chaplin. Unfortunately, Adolf Hitler also wore one and because the style of facial hair became synonymous with him, few have dared sport one since (except of course for certain African dictators and comic book newspaper editors). The toothbrush mustache wasn't the only cultural appropriation ruined by the Nazis. There was once a form of classicism that sought to modernize traditional forms for the twentieth century. This "new classicism" took the proportions and basic elements of classical architecture but streamlined them so as to make them more reflective of the age. This hybridized approach to modern architecture was popular throughout the United States in the 1920s and 1930s. 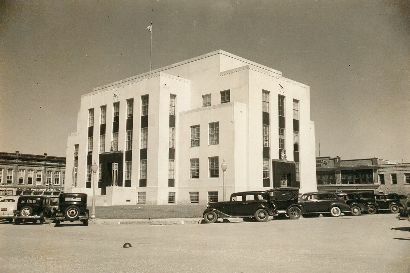 In Texas there were many architects who built county courthouses in the style that was growing in popularity. Unfortunately Hitler's architect liked the style as well. 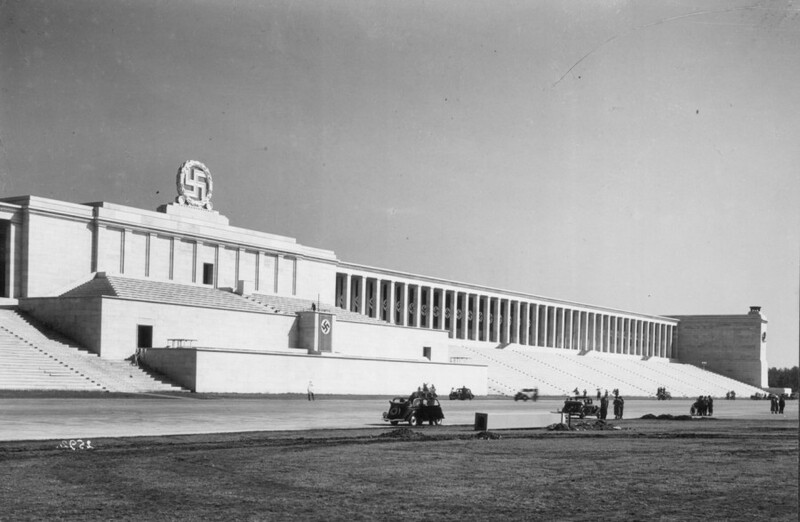 Albert Speer was a young architect when he attended his first Nazi rally. By 1933 he was given the title of "Commissioner for the Artistic and Technical Presentation of Party Rallies and Demonstrations" and was tapped to produce for many of the more famous (or at least infamous) Nazi monuments. His Zeppelinfeld served as the location of immense Nazi rallies and was inspired - somewhat ironically - by a World War I memorial designed to honor two of Germany's enemies in the previous World War. It was designed by a French-American architect by the name of Paul Cret. Cret was of the generation of architects who were trained and skilled in the classical language of architecture but was able to apply those sensibilities to an emerging modes of modernism. Cret was certainly respected for his more traditional work - he designed a number of the buildings on the UT campus - but he also became known for a more stripped-down version of classicism. In an alternative universe, Cret and his approach to architecture might have been more influential, but Cret died in 1945 just a few months after the defeat of Nazi Germany. Much of Speer's work was destroyed and architects and the general public alike turned away from the architecture and the mustaches that had become associated with Nazism. Modern architecture flourished in the post-war years, but it developed in a more abstract way that consciously broke with the traditions of the past.